"Sophisticated but at the same time dramatic and seductive, Tangerine Tango is an orange with a lot of depth to it," said Leatrice Eiseman, executive director of the Pantone Color Institute. "Reminiscent of the radiant shadings of a sunset, Tangerine Tango marries the vivaciousness and adrenaline rush of red with the friendliness and warmth of yellow, to form a high-visibility, magnetic hue that emanates heat and energy." Over the past several years, orange has grown in popularity and acceptance among designers and consumers alike. It has become more and more accepted in the fashion and home industries and is a color that will continue to do so throughout the year. Energize interior spaces with Tangerine Tango patterned home accessories. Pillows, bedspreads and tabletop accessories in this high-impact hue add spice and a pop of color to any room. Looking for an inexpensive way to perk up your home? Paint a wall in Tangerine Tango for a dynamic burst of energy in the kitchen, entryway or hallway. Greenhouse has multiple fabrics to fit this radiant color way. The fabrics shown above are 97123, 97122, A1011, 99570, 98269, 98346, A2710. 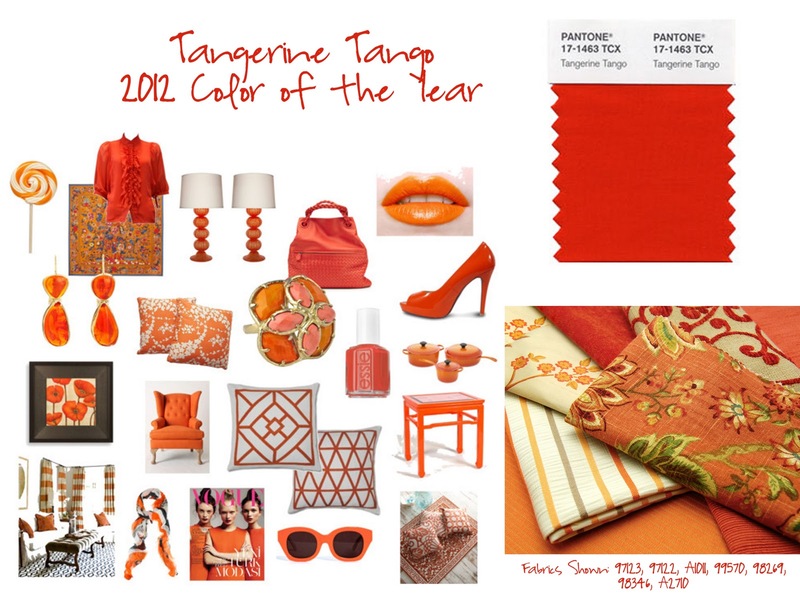 You can visit Greenhousefabrics.com to find these fabrics as well as many others to coordinate with Tangerine Tango!